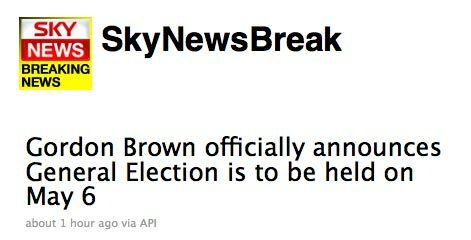 A quick update on developments with Sky News’ breaking news Twitter account, launched by the broadcaster in December – the @skynewsbreak account is now incorporated in the news ticker running across the top of the SkyNews.com website. Sky News Online executive producer Julian March first mentioned plans for this when speaking to Journalism.co.uk in January about increased use of social media for newsgathering amongst Sky News staff. This entry was posted in Social media and blogging and tagged News ticker, Sky News, SkyNews.com, skynewsbreak, television, Television in the United Kingdom, Twitter on April 6, 2010 by Laura Oliver. Author, journalist and media personality, Melvyn Bragg, will receive the Media Society Award for 2010 to recognise his long-standing contributions to the industry. With 20 published novels, 32 years at the helm of The South Bank Show and his present post at BBC Radio 4’s program, Our Time, under his belt – the accolade is a timely nod to Bragg’s influence across the industry. Annually bestowed upon an individual for outstanding contributions to the media, Bragg finds himself in good company, with those in previous receipt of the award including Sir David Frost, Jon Snow, Sir Michael Parkinson and last year’s winner, Jeremy Paxman. “Bragg’s contribution is immeasurable; his formidable journalistic skills have engaged our intellect across the broad sweep of all forms of art and culture. He is our chronicler of arts – a cornerstone of cultural programming and thought,” says president of the Media Society, Geraldine Sharpe Newton, in an announcement. Bragg will receive his award on 3 June. This entry was posted in Broadcasting, Events and tagged Author journalist, BBC Radio 4, British people, Entertainment/Culture, Geraldine Sharpe Newton, media personality, Melvyn Bragg, Television in the United Kingdom, The Media Society, The South Bank Show on February 9, 2010 by Romy van den Broeke. Radio Times and Gardeners’ World magazine could soon have new owners. The BBC is considering the sale of its magazine division, which produces 50 titles, after being ordered to curb its money-making activities. In response, the BBC said that “no decisions have been taken about any of our businesses”. This entry was posted in Broadcasting, Editors' pick, Newspapers and tagged BBC, BBC Worldwide, British Broadcasting Corporation, Radio Times, Sunday Times, Television in the United Kingdom, the Sunday Times, The Times on January 25, 2010 by Judith Townend.